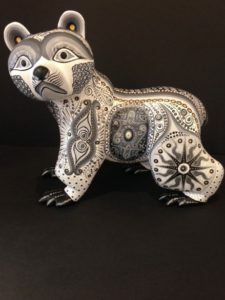 In May, we will be featuring the folk art of Oaxaca, Mexico. Fanciful carvings called alebrije or animalistas were first done by artist Pedro Linares Lopez in the 1930’s. When documentarian Judith Bronowski made a documentary about Pedro in 1975 he soon rose to international fame. The art form took off and we are proud to have over 80 families represented in our gallery.